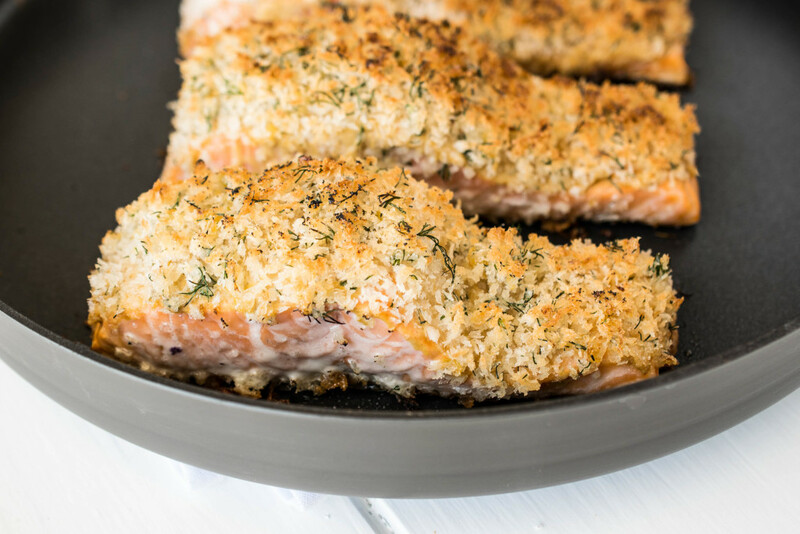 Mix the panko, lemon zest, parmesan cheese, dill, salt, pepper and a mix of butter and olive oil. Dijon mustard is spread onto the top of the salmon, along with salt and pepper. The breaded topping is then added and the dijon acts like a delicious ‘glue’ to hold it all in place. When the oil is slightly rippling add the salmon filets, skin-side down and cook for 3 minutes. Transfer the pan to the oven and bake for 8 minutes until the breading is golden brown. Do you think you could use regular breadcrumbs instead of panko? I don’t see anything wrong with using regular breadcrumbs. I only specified panko because I like them so much. If you try it, I’d love for you to come back and leave your comments. Have a great night. This was a tasty dinner, even for people who don’t like salmon. My husband has a like/ hate thing with salmon. Most days he’s not a fan, but this was a hit. 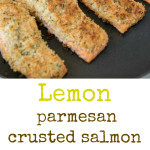 I loved how the flavors of the parmesan and lemon worked together. I came across your blog on pinterest and actually did this recipe. It was amazing. My question is have you tried this with chicken breast filets with the same ingredients? Would it still taste good? Any advice? Awesome. I must try then. Should i pan fry or still bake in the oven? If so how long do you think in the oven and at what temp? I think either way would be good. If you bake, I would say 375°F for about 20 minutes. Enjoy! Made this Salmon this week; it was absolutely DELICIOUS!!!! Thanks for posting. I love to hear this Wanda, thank you. It’s one of my favorite salmon dishes. Yum! I made this for dinner last night and we loved it. I cooked the salmon in the oven only for 13 minutes. It was perfectly cooked, well seasoned, and the topping was golden brown and delicious. I may not add the dill next time because my husband doesn’t like it, but I will definitely make this again. Thanks for the recipe! I made this for our anniversary dinner and my husband was floored. He loves salmon and this is now one of his recipes. I made it with lots of garlic and served on top of rice pilaf. I must agree – it was mouthwatering. Definitely making this again thank you so much! I love to hear this, thank you so much for the feedback Rachel. Love the flavor combination used here! Such a tasty and healthy dish! What a delicious way to serve Salmon! We love Salmon and you can be sure this delicious dish will be on our table soon! Yum! Great video — this looks so yummy! Such a great combination! 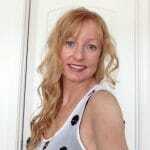 Love the video, pinned! What a fabulous recipe! And a nonstick dishwasher safe pan?!?! Awesome! 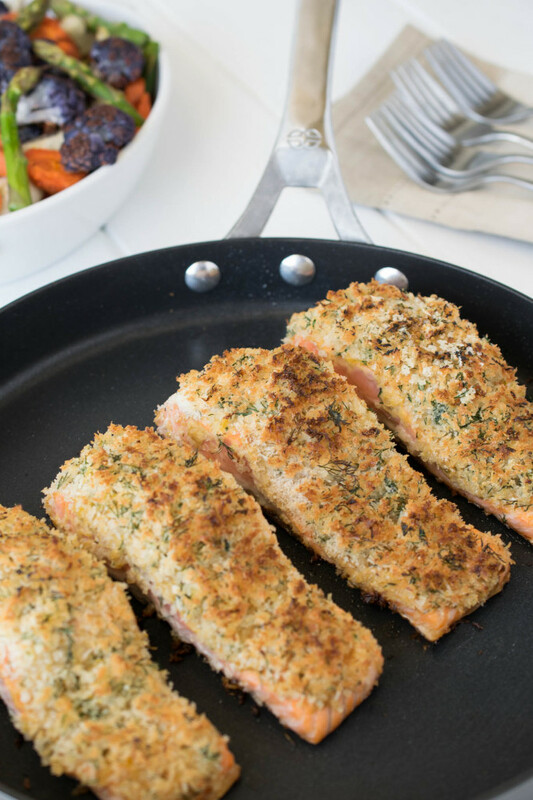 I love everything about both the salmon and the pan! Thanks for the info.